Following the opening of Samia Halaby: Paintings from the Sixties and Seventies on 18 May, Ayyam Gallery London will host a discussion with the renowned artist on Tuesday 19 May at 1:00 pm. 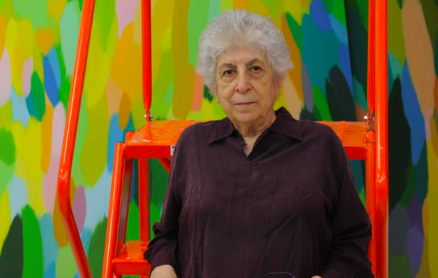 The public talk will explore Halaby’s initial development as a painter, beginning with her career as a young academic at American universities where she implemented a groundbreaking undergraduate art program before becoming the first female associate professor at the Yale School of Art in the 1970s. Moderated by art historian Maymanah Farhat, the conversation will detail the aesthetic breakthroughs that established Samia Halaby’s celebrated oeuvre, charting her early experiments in painting as she worked through an intensive series of trials and sought a materialist approach to abstraction. Among the topics addressed in the event, particular attention will be given to how Halaby broke free from the constraints of abstract expressionism, an aesthetic that although waning at the time still swayed American schools of painting. Additionally, a section of the talk will be devoted to the influence of Islamic art on the artist and the ways in which formal properties can represent phenomena found in nature, serving as corresponding facets that trigger the senses and establish recognition.